Veesible at latitudes atween +90° an −35°. 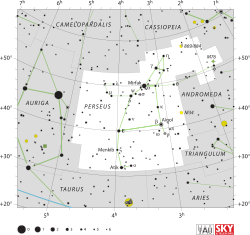 Perseus, named efter the Greek meethological hero Perseus, is a constellation in the northren sky. This page wis last eeditit on 20 August 2015, at 15:06.